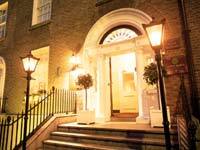 Situated on Leeson Street Lower The Stephens Hall Hotel and Suites is ideal for all your needs. The hotel offers the guest an extremely high standard of accommodation. This stylish hotel prides itself on its highly trained personnel who provide excellent service, attention to detail and a hearty welcome. The guest will enjoy a luxurious stay in a home away from home atmosphere in The Stephens Hall. It provides very well-appointed all suite accommodation equipped with every facility and comfort. All suites have a spacious living room and a fully equipped kitchen. Facilities include in room fax machine, modem point, CD player, TV, Trouser Press Iron and Ironing Board and hairdryer. The suites are set in an ideal location for exploring Dublin. A hearty breakfast, lunch and dinner can be enjoyed every day in The Romanza's Restaurant. The restaurant prides themselves on their excellent Italian cuisine and vegetarian dishes. Overnight parking is available on paying a small fee. The hotel and suites are perfectly located for exploring Dublin’s main shopping and visitor attractions. Henry Street and Grafton Street have a massive selection of superb shops. The guest can visit The National Art Gallery, Merrion Square Gardens and Dail Eireann which are all near by. Or conclude the day with a leisurely romantic walk along Dublin’s Canal.